The weekend is almost here! Hooray! 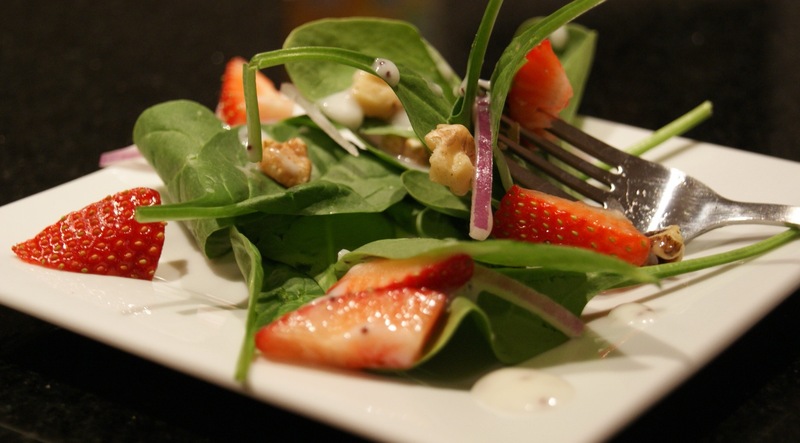 Emily has a bunch of holiday health posts on her blog: anutritionisteats.com – check them out! Being mindful of portions allows us to have stuffing and eat our pie too. 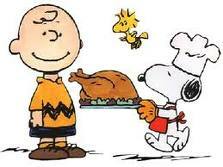 Of course we will eat a little more than usual on Thanksgiving and that is fine! But, Friday is back to normal eating and activity levels. Don’t feel like you’ve blown everything by eating too much on Thursday and say, “It’s too late now, I’ve already eaten too much and gained weight so it doesn’t matter if I eat more today.” That’s not how weight gain works and that’s certainly not the attitude to have. 1/2 plate for fruits/vegetables: round out your plate with leafy salads, sautéed vegetables, fruit salads, etc. This should leave you pleasantly full, without being so full (like a 8-10 on hunger-fullness scale) that you feel sick. Before you go back for seconds, take some time to really decide if you are hungry. If it’s not hunger and just something that you want, maybe your host will let you take another serving home with you. Why not start Friday off with a quick workout that doesn’t require any equipment (no excuses for not being at home 🙂 hehe ) and a healthy breakfast of oatmeal or 2 eggs and a piece of whole grain toast. Prepare the Broth: Cover turkey carcass in large pan. Chop one onion into large pieces and add them to water. Bring to a boil, reduce heat and let simmer for about 3 hours. When cool, strain all the liquid out and separate meat and bones. Set aside meat and discard bones. Prepare the Soup: Mince remaining onion. 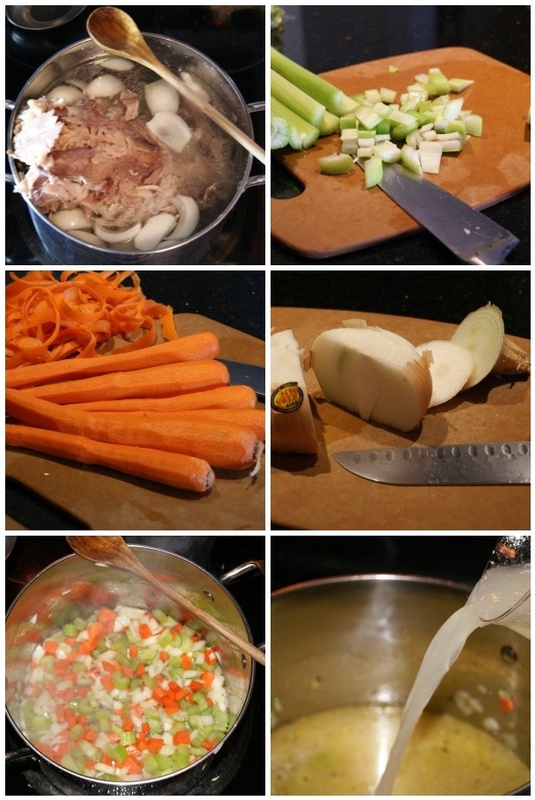 Heat olive oil in large pan and when hot, add onions, carrots, celery and garlic. Season with salt & pepper and remaining spices. Stir occasionally for about 5 minutes. Add 12 cups of broth and the shredded turkey to the pot. 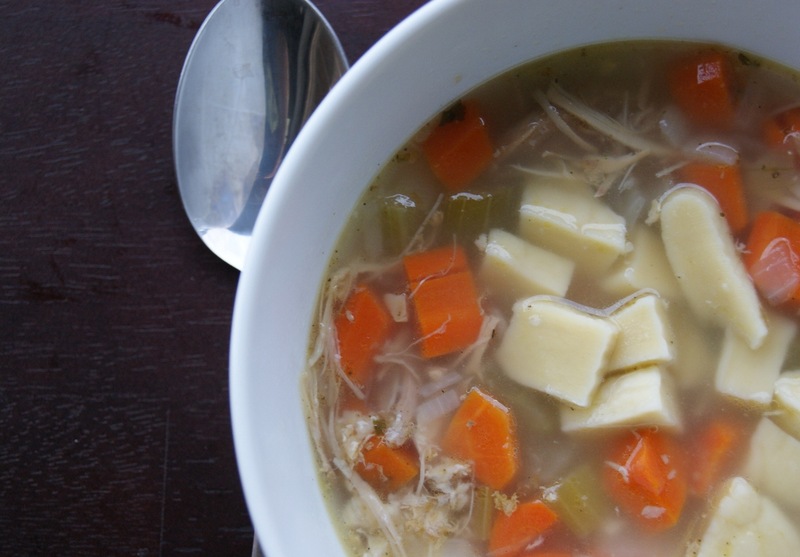 Bring soup to a boil, reduce heat and let simmer for about an hour. Add cooked noodles and taste! Add more salt and or seasonings if necessary – remember the broth doesn’t have any salt in it. Along with the heavier sides of stuffing and mashed potatoes, a light and healthy spinach salad is welcomed on any Thanksgiving spread. The combination is a classic one, and ever since my boss recently made it, I knew it needed a place on my table. And soon. Couldn’t your Thanksgiving plate use a little something healthy? I’ve never prepared an entire Thanksgiving meal (and that’s probably a good thing) but I can only imagine that if you do, some of the dishes need to come together without much prep and come together quickly. So this salad is everything you want for a hectic, calorie-laden day: easy to make, a healthy dose of greens and delicious to boot! 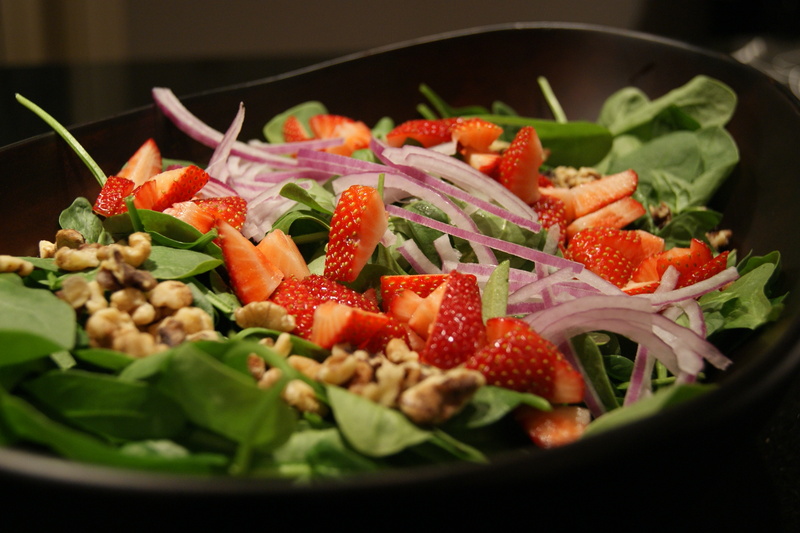 Toss together spinach, onion, strawberries and dressing. Sprinkle walnuts on top and serve. Pre-heat oven to 350 degrees. Heat olive oil in a large skillet. When hot, add onions, celery, salt and pepper. Sauté for about 4 minutes, until translucent. Add mushrooms and cook until tender, another 4-5 minutes. Stir in fresh herbs and set aside. 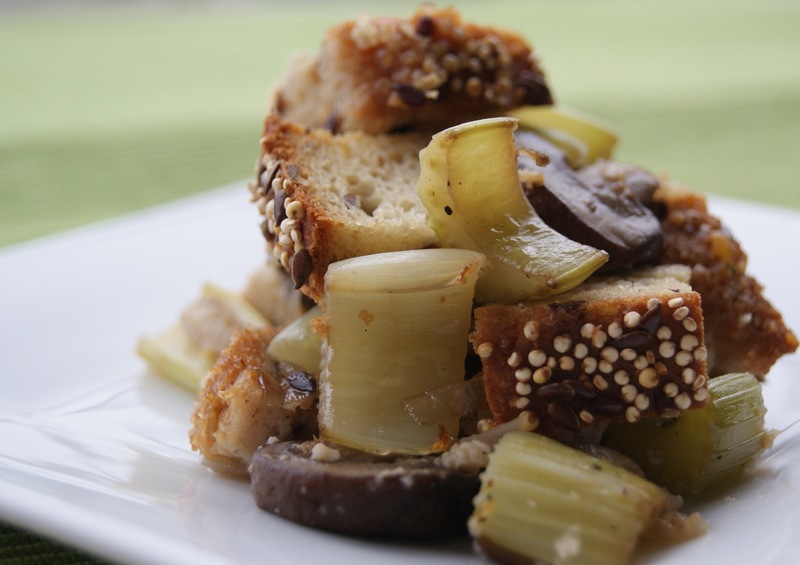 In a large bowl mix bread pieces, mushroom mix and 1 ½ cups hot broth. Stir to combine and pour into 9 x 13” greased pan. Pour 1 cup hot broth over the top and cover with foil. Bake for about 25 minutes, remove foil and bake for about 10 more minutes. 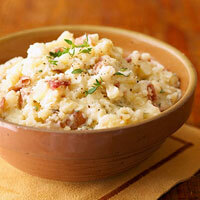 Mashed potatoes always get a bad name, but this year Fitness Magazine gave them a make-over and you can too! 1. To roast garlic, wrap unpeeled cloves in foil. Bake in a 400-degree oven 25 to 35 minutes or until cloves feel soft when pressed. When cool enough to handle, squeeze garlic from peels into a small bowl. 2. Meanwhile, put potatoes in a large saucepan with enough cold water to cover. Bring to a boil over high heat. Lower heat to maintain a simmer and cook until tender, about 20 minutes. Drain potatoes; return to saucepan. 3. Mash potatoes and softened garlic with a potato masher or an electric mixer on low speed. Add sour cream; milk; oregano, rosemary, or thyme; salt; and black pepper. Beat until light and fluffy. Roast Story: “Roasted garlic adds richness without fat,” says Jennifer Iserloh, author of Secrets of a Skinny Chef. Sour Power: Low-fat sour cream gives these taters a velvety consistency and a punch of flavor. Potato Pick: Try Yukon Golds, which have a naturally buttery taste that’s just right in mashed potatoes. Herbal Essence: Fresh herbs are one of Iserloh’s healthy staples because they boost flavor but not calories. These 3 common mistakes make for mushy potatoes. Using hot water. Start potatoes in cold water, not warm, and then bring to a boil. Adding cold ingredients. Let milk and sour cream reach room temperature before combining with hot potatoes. Overmixing. Use an electric mixer, not a food processor; stop as soon as milk and sour cream are incorporated. Originally published in FITNESS magazine, November/December 2010. With thanksgiving in about a week, we are already thinking of ways to make the Holiday season a little healthier. These cupcakes are a great way to enjoy a special treat without too many calories! Combine all cupcake ingredients in a mixing bowl with 1/3 cup of water. Whip with a whisk or fork for 2 minutes until well blended. Spray a 12-cup muffin pan with nonstick spray or line with baking cups. Evenly spoon batter into muffin cups. Place pan in the oven and cook for about 12 minutes (until cupcakes have puffed up but still appear a little gooey on top). Once cupcakes are cool enough to handle, arrange them closely on a plate so that the edges are touching. Place caramel and soymilk in a tall microwave-safe glass or dish (mixture will bubble and rise when heated). Microwave at medium power for 1 1/2 minutes. Stir mixture vigorously until smooth and thoroughly blended. (Return to microwave for 30 seconds at medium heat if caramel has not fully melted.) Immediately drizzle caramel sauce over cupcakes.